No one wants a bad smell lingering in their house. But the way you deal with invasive odors can actually impact your health. Air fresheners might seem harmless, but they come with chemical dangers you might not know about. Cleaning products of all kinds can contain chemicals and additives. But air fresheners in particular can pose certain risks. “You want to be wary of this category especially due to respiratory health concerns,” Samara Geller, senior research and database analyst for the Environmental Working Group (EWG), told The Active Times. “In fact, there’s recent research that shows women who use sprays and other cleaning products such as air fresheners in the form of sprays as little as once a week may experience diminished lung function.” For female cleaning workers more frequently exposed to these products, Geller says, the risks equated to the impact of smoking a pack of cigarettes every day for 10 to 20 years. Many air fresheners rely on aerosols, which have been blamed for releasing high levels of volatile organic compounds (VOCs) in households that use them. “These VOCs can produce ground-level ozone in the home, which is hazardous,” Geller said. 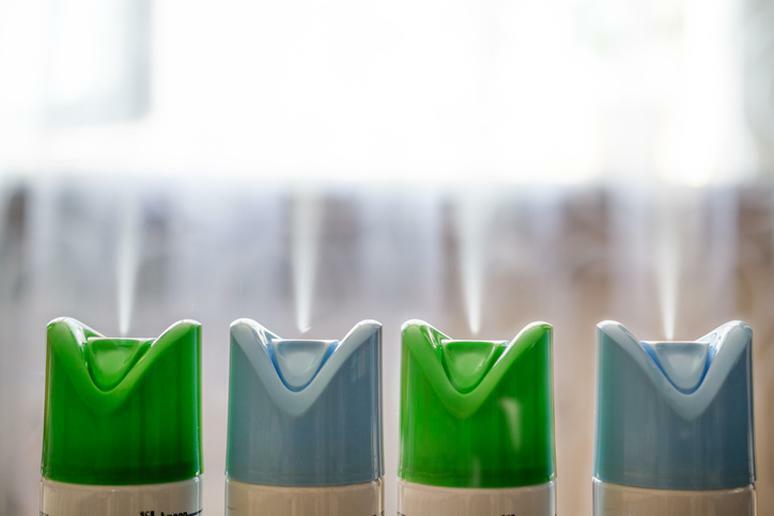 “They can also react with different chemicals that are already in the home to create secondary aerosols, the very fine droplets that can be inhaled deep in the lungs.” These risks are specific to aerosol air fresheners — so if you do use these products regularly, you may want to opt for one with a different type of canister. Additionally, there’s the issue of chemicals included in products that aren’t listed on the ingredients label. “Catch-all terms like ‘fragrance,’ ‘perfume’ or ‘scent’ hide a black box of potentially hazardous chemicals,” Geller explained. “It could essentially be made of scent compounds, but can also include different additives such as phthalates and preservatives.” There is concern that phthalates in particular may be disruptive to the endocrine system — studies in animals have shown deleterious effects, though no conclusive link has been demonstrated in humans. Other air fresheners use essential oils and other “natural” ingredients. But, Geller says, these oils don’t exist in such high concentrations in nature. As a result, even some “natural” ingredients can be intense and produce a reaction in sensitive individuals. Geller recommends testing new products while children and those with sensitive skin are absent. The Active Times has reached out to Procter & Gamble (the company behind Glade and Febreze air fresheners) and Air Wick for comment on the safety of using air fresheners. There are some less risky ways to keep your home smelling fresh. The first precaution is to opt for air fresheners with ingredient transparency. The EWG publishes a list of air fresheners online ranked in terms of their safety and ingredients. Many air fresheners on the market are free of harmful chemicals. Old coffee grounds are effective at absorbing airborne particles that create odors; place these grounds in bowls around the house to eliminate unwelcome smells. Baking soda works the same way as an all-natural solution. You may put coffee or baking soda at the bottom of your trash can, for instance, to stop smells at the source. Geller’s last piece of advice is even simpler: Open your windows. “Clear out those odors and get air flowing through your home,” she advised. You may not even need air fresheners at all; they, like these other common household products, could be putting your family’s health in danger.